River 2 Lake Initiative – Collaborating to conserve & restore our Flathead River and Lake natural heritage. The River to Lake Initiative is a collaborative effort to conserve and restore our Flathead River and Lake natural heritage – excellent water quality, outstanding scenic and recreation values, abundant fish and wildlife, and prime farm land. River to Lake Initiative partners work with interested landowners to protect their property’s conservation values through voluntary conservation agreements, land acquisition, and fair-market financial incentives so that the Flathead always remains a special place. Our River Steward Program helps landowners improve and restore habitat – wetlands, and riparian areas – along degraded streams and rivers in the Flathead Valley. We say we own (the land), but at the end of the day, we’re just tenants. And it’s our obligation to leave it in better shape than when we took it over. We take pride in that. Now we know people will enjoy this place – will enjoy this open space – for a long time. 12,000 acres of critical wetlands, riparian areas, fish and wildlife habitat, and farm lands protected. 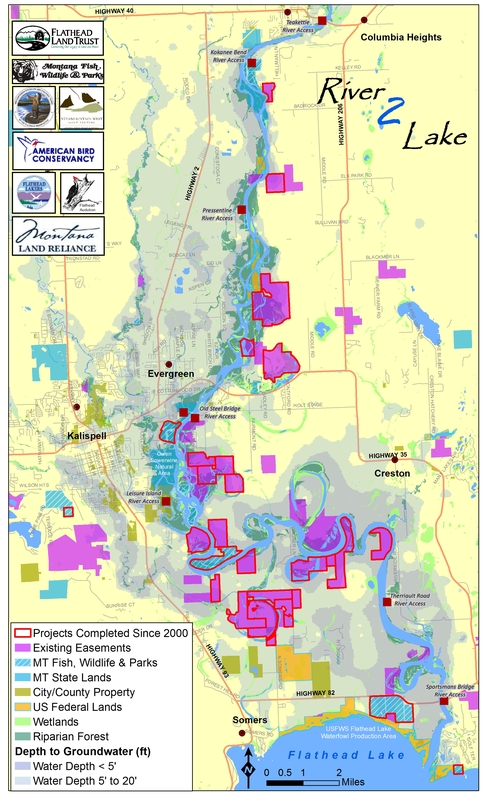 The River to Lake Initiative encompasses the main stem of the Flathead River (from the junction of the North, Middle and South Forks) to the North Shore of Flathead Lake in Northwest Montana. Quality of life: The river and lake support our recreation heritage and benefit the economy in many ways. By protecting the Flathead River to Lake system, we protect our quality of life and the thread that connects us as Flathead Valley residents. Clean Water: Flathead Lake’s famous clear water depends on the wetlands, floodplains and vegetated stream and river banks upstream. These critical lands naturally absorb, filter and clean stormwater runoff before it reaches the river and lake. Habitat: The Flathead River and Lake system, in Northwest Montana, provides habitat for native fish and an incredible array of wildlife, including critical nesting and migratory stopover areas for thousands of waterfowl. This habitat supports our fishing and hunting tradition. Farming: The sediments deposited by the river during the time of glaciers created some of the richest soils in Montana, supporting the Flathead’s farming heritage. River to Lake partners provide incentives and options for interested landowners to conserve critical habitat, restore vegetated stream banks, and sustain farms. These critical lands help protect water quality and encompass some of the valley’s best native fish and wildlife habitat and agricultural soils. To learn more about how you can participate, please see the how you can help section of this web site or contact us.